By law, all spring traps must always be set inside an appropriate natural or artificial tunnel or a purpose made container such as the Elgeeco Fenn Cage. Fenn Cages can be located on or off the ground. They are portable and a convenient alternative to wooden tunnels. 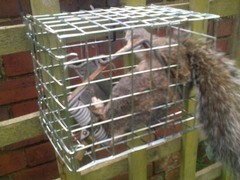 The Mk 4 Fenn spring trap (left) is approved for Grey Squirrel, Weasel, Rat and Mouse. 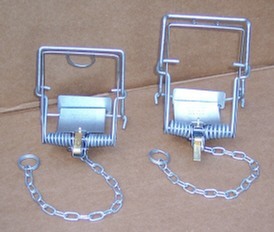 The Mk 6 Fenn spring trap (right) is approved for Rabbit, Mink, Grey Squirrel, Weasel, Rat and Mouse. Always carry out a thorough risk assessment of the proposed trapping area to avoid accidentally catching protected species and non-target domestic pets. In the UK, spring traps must satisfy parliamentary approved mechanical characteristics. 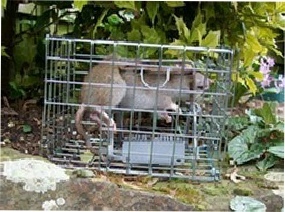 Some traps on sale in the UK are imported and do not satisfy these requirements; and their use is illegal here!